After a second loooong day of driving (400+ km, or over 250 miles), we arrived in the late evening in Akureyri, Iceland’s second largest city, located on the west side of Eyjafjörður fjord on the north coast. We were hungry, and we ended up at Krua Siam. Something that surprised me with Iceland was that it has a substantial Thai population, and way more Thai restaurants than you’d think. But Iceland also has some very good lamb and beef, so we figured it would be nice to check out one of Iceland’s many Thai places when the opportunity presented itself. 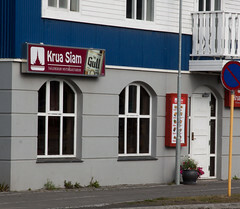 In Akureyri, we finally had a good opportunity, since Krua Siam was right by our hotel. First up was the Tom Kha Kai, which came out as a nice, generous boel of rich coconut milk broth (with nice lemongrass notes) and a nice assortment of chicken, thai basil, and veggies. We didn’t see a whole lot of chicken in Iceland (either on farms, or on menus for that matter), so that was also a nice switch up from our more typical fish dishes we were eating throughout Iceland. Next up was the Yam Nua, a spicy Thai beef salad served up cold. 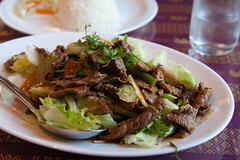 This was a nice version of Yam Nua: tender slices of well seasoned beef served up on a bed of lettuce with a good helping of thai chile peppers, cilantro, and cucumber. The result was crisp and refreshing, while also having a nice pepper bite. 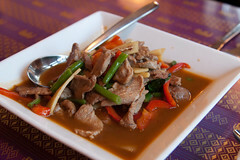 Our other main dish was Pad Kra Paw, a very spicy and rich curry and basil stir fry. Offered with a choice of meats, we opted for the Icelandic lamb. I was quite pleased with this dish, this was very flavorful, very spicy (in contrast to most Icelandic food, which is usually very flavorful, but if it’s hot at all, is a black pepper spicy), and the use of high-quality lamb made for a particularly good dish. The meat was excellent, the spicing level refreshing hot, and the vegetables and sauce quite aromatic. I thoroughly enjoyed this as a nice example of an Icelandic take on a classic Thai dish. Overall, I really enjoyed Krua Siam. It was a very nice counterpoint to the other (wonderful) meals we had throughout Iceland, using a rather different ingredient set. 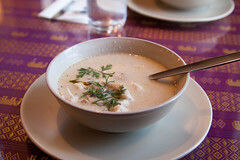 And, quite frankly, the place was noticeably better than most Thai places I regularly get to here in the US. Have you ever had one of those places where you’ve driven by it dozen of times, always saying to yourself “You know, I should check that place out?”, but you never seem to get around to it? Santarpio’s Pizza in East Boston was one of those places for us. For years, every time we went to Logan Airport via the Callahan Tunnel and Route 1, we’d see this pizza place off to the side of Route 1A. You can’t really miss it, since the sign for Santarpio’s (I’ve heard some locals call it “Tarp’s”) on their second story is at eye level when you are on 1A. It’s been there forever, and I always wondered if it was any good. Well, recently I had to pick up my brother at the airport, and his schedule was convenient for doing a pizza run, so we finally went over to check it out.